One of my fondest childhood memories was of visiting the Tid-Bit in Martins Ferry, Ohio and buying out their old collection of chemistry set chemicals for 60 cents each. I bought the fun stuff like sulfur, copper, iron filings, and potassium nitrate (charcoal I could make at home) and some off the odd stuff like Cobalt Chloride that I just loved to look at for the color. I learned very little from my “experiments” except how to make bright flames (my dad never let me pack the things I made so I couldn’t blow anything up) but I did learn a healthy respect for chemistry and chemicals. My dad understood that chemistry sets were, on the aggregate, harmless but in this ever-litigious world in which we live, that understanding is quickly being supplanted by the belief that kids are demons waiting for a chance to blow up a truck and head off to Gitmo. 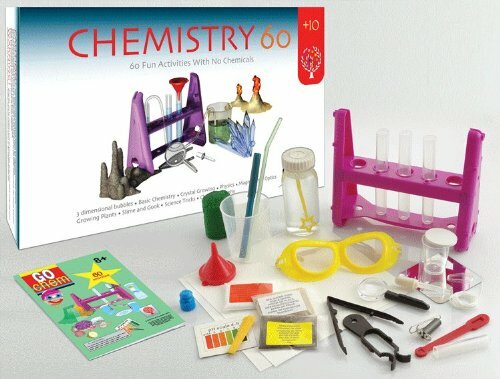 To wit: this chemistry set without chemicals. While I’m all for ensuring my kids don’t eat lye, there has to be a better way here. This is obviously all about parental supervision and, although my dad stopped coming down to my weird chemistry lab over time I did spend hours with him experimenting with chemicals and talking about the things he used to do with them and outlining the things I was permitted to do. As Sean at Make notes, this kit causes us to “lament the general state of affairs we have come to thanks to litigiousness, chemophobia, and flagging scientific literacy.” While I believe there is still hope, junk like this ain’t helping.